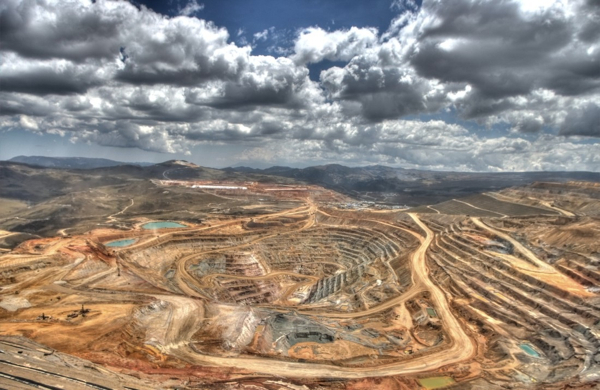 The nearly exhausted Yanacocha gold and copper mine, Peru, is an example of extractivism. The Conga Mine has been proposed nearby to replace it and has generated protests. I propose understanding the coyuntura (juncture) through which South America passes as the region’s entry into the situation of systemic chaos that the world travels through. I postulate that last weekend’s demonstrations in some of Brazil’s large cities and the internal and external attacks that the Venezuelan government suffers embody a qualitative leap in that direction, in which four large forces are deployed, whose frictions and crashes make for a situation of growing chaos. The first sentence of the Global trends 2030 report, issued by the United States National Intelligence Council in 2012, emphasizes that in 2030 the world will have suffered “radical changes” and that no country will boast of global hegemony. The agency’s fifth report concludes that power has shifted towards the east and the south and that the Asian economic and strategic space will have exceeded that of Europe and the United States together. We are in full transition towards that world. Based on that forecast, US elites grapple with the analysis of its principal geo-strategist, Nicholas Spykman. More than half of his work America’s strategy in world politics, published in 1942, is dedicated to the role that the power should play in Latin America, and particularly, in South America. The Brazilian political scientist José Luis Fiori remembers it as well; the key is the separation of a “Mediterranean” Latin America from the rest, which includes Mexico, Central America, the Caribbean, Colombia and Venezuela, as a zone where US supremacy cannot be questioned, “a locked sea” whose keys belong to Washington. The rest of South America, the countries outside the zone of “immediate hegemony,” is treated only partially different. Spykman proposes that if the big states of the south (Argentina, Brazil and Chile) unite to counterbalance US hegemony, it ought to respond to them by means of war. Fiori laments that the region’s countries, particularly Brazil, may not be as clear about this as the superpower (Valor, 29/1/14). Three forces are undermining United States hegemony in both zones: 1) China, 2) the progressive governments and 3) the popular movements. Together, we have four forces in dispute, whose collision will define the Latin American scenario for a long time. In some ways, they represent the roles that the Spanish (and Portuguese), English, Creoles and popular sectors played during the wars for independence. The first of those forces, the United States, counts on military, economic and diplomatic power, besides powerful allies, so as to destabilize those that oppose it. Certainly, it no longer has an almost absolute power like the power that permitted it to unleash State coups to discipline the region at its whim, like in the 1960s and 70s. The second force, China, is basically deploying economic and financial power. It has made strong investments in Venezuela, Argentina and Ecuador, it maintains important relations with Brazil and Cuba, and risky projects (for the United States) go forward like the Nicaragua Canal, which will compete with the Panama Canal. The first China-CELAC Forum, held in January in Peking, is a sample of the advance of Chinese relations with Latin America and it announces that this process is not going to stop. The third force, the progressive governments, is the most vacillating and contradictory. On the one hand, they are supported in the emerging countries, above all China, and in a lesser measure Russia. On the other hand, they support the extractive model, which implies an alliance with China (and others), but, above all, it is a mode of accumulation that strengthens the right and the bourgeoisies, just as the industrial model strengthened workers, unions and left parties. Venezuelan oil revenue requires intermediaries separate from the workers, be they managers, administrators or military men. Brazil is a good example. The mining/soy/real estate extractivism  weakens the movements, gives more power and force to the multinationals and to urban speculators, to such a degree that their most conspicuous representatives are in Dilma Rousseff’s cabinet. Continuing with the extractive model is political suicide. It polarizes society and alienates the popular sectors of the lefts. It does not generate corruption: it is corruption, because it is based on the dispossession of campesinos and the urban poor. To the fourth force, the organized popular sectors that are the axis of this analysis, extractivism/accumulation by dispossession/fourth world war is a permanent attack on their ways of life and survival. The big news of the two last years is that they are progressively becoming autonomous from the progressive governments, in large measure as a consequence of the reigning model, which condemns them to being dependent on social policies affecting their dignity. These policies are losing their capacity for discipline, as was demonstrated in Brazil in June 2013 and more all the time in the region. The new-new movements that are emerging, added to the old movements that have been capable of reinventing themselves to continue fighting, are reconfiguring the map of social struggles. If the progressive governments persist in their alliance with the emerging countries and with fringes of the bourgeoisies of each country, they will continue bloodying the breach that separates them from the organized popular sectors. The movements of those below are the only force capable of defeating the current rise of the right and interference of the United States. Just like the cycle of struggles at the end of the 1990s and the beginning of 2000 delegitimized the neoliberal model, only a new cycle of struggles can again modify the relation of forces in the region. As the case of Brazil after June 2013 demonstrates, the progressive governments are shown to be fearful of the autonomous movements and prefer to weave alliances with conservative powers. 1. Zibechi uses the term “extractivism” to describe what is referred to as “despojo” in Spanish or “dispossession” in English. It is a process that describes how capitalist accumulation results in displacement of campesinos and the urban poor, as well as destruction of the environment (Mother Earth).